Two of Canada's most influential progressive independent media publications combined efforts in the fall of 2013, following the agreement by rabble.ca to join forces with Straight Goods News. A pioneer in independent, online media, SGNews closed after 13 years of publishing in September 2013. Publisher Ish Theilheimer summed up the legacy of SGNews: "I do want to tell you how much I have valued your support and readership. I'm very proud of the work of our outstanding staff and of the national stable of writers who freely contributed to make SGN a great read, week after week. I'm proud to belong to a nation -- and world-wide community that includes you and thousands of other caring people who think for themselves and act on what they think and believe. I do hope you'll transfer the kind of loyalty you've shown us to our new partners at rabble.ca." rabble.ca is honoured to take on the role of maintaining the legacy of SGNews. 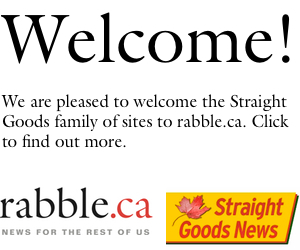 As part of the agreement, rabble.ca will maintain an archive of the 13 years of online coverage provided by Straight Goods News, and has welcomed all Straight Goods News contributors to continue providing innovative coverage under the rabble.ca banner.